I love the photo in the Eduardo Porter column. MTM looks so very Stepford. Hi Bill. Maybe you could help me sort out my thoughts on productivity? "Labor productivity" is one version. This is the straightforward "output per hour" calculcation. "Total Factor Productivity" is another version. The calculation is more complex. Seems to be John Fernald's area of interest. As you say, TFP "is calculated as a leftover, by subtracting from output growth the portions that can be explained by changes in capital and labor." I'm thinking "labor productivity" includes the changes in capital and labor, and TFP is the part not explained by labor productivity. Is that somewhere in the ballpark, do you think? I'm not trying to calculate it, just to understand how labor productivity relates to TFP. Yes, I think you've got the right idea: labor productivity would increase due to either an increase in tfp or an increase in capital per worker ("capital deepening"). The calculation of labor productivity is: %d(Y/L) = %dTFP + ks*%d(K/L) where I'm using "%d" to denote percent changes, Y for output, L for labor, K for capital and ks for capital share. From the point of view of living standards, its labor productivity that matters - i.e., normal people wouldn't care if their wages were going up because of technological progress or capital accumulation. Thank you Bill. That helps a lot. 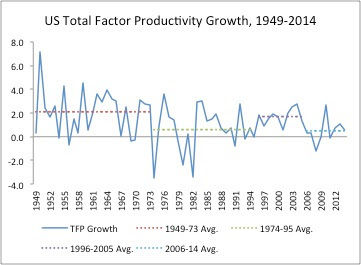 Somehow, I missed the idea that TFP adds in to overall productivity -- even though I know TFP "is calculated as a leftover, by subtracting from output growth the portions that can be explained by changes in capital and labor" as you said. Maybe I was thrown off by the word "total" in 'total factor productivity'.